For those celebrating, I thought I would share a quick watercolor I did this weekend of a magical Easter Bunny. A bunny that is THE Easter bunny would have to be magical right? In doing a bit of quick internet research, I learned the Easter Bunny originated in Germany in the 1500s, and came to the United States in the 18th century through Protestant German immigrants in the Pennsylvania Dutch area (not far from me in Mars, PA!). They told their children about the “Osterhase,” who brought good children colored eggs, candy, and sometimes toys in nests they made in their caps and bonnets before Easter. 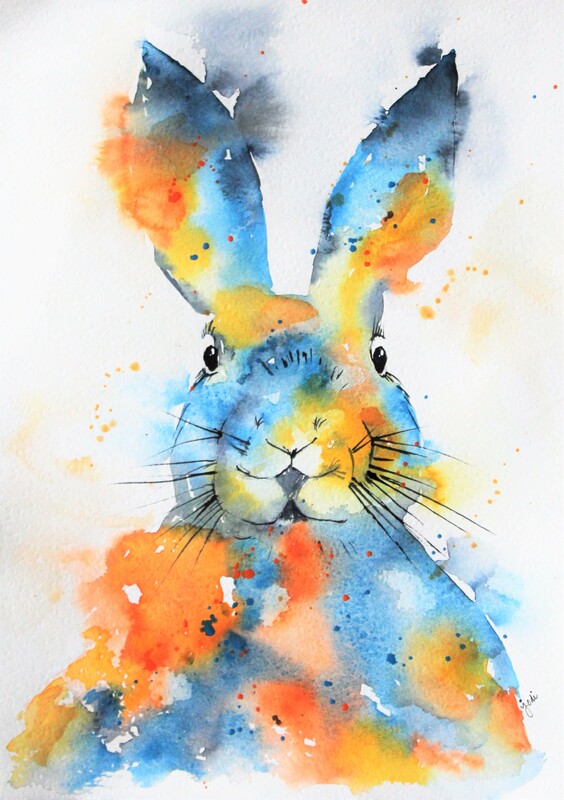 Whether you celebrate Easter or not, I hope this magical watercolor bunny brings a smile to your face and joy to your day. Jodi, that’s a really cute watercolor bunny. Also, happy Easter to you too! It brought more than a smile. Love it, and you are very talented. Thanks so much!! Happy Easter! Beautiful bunny, Jodi! Happy Easter to you, too! Question for you: I am looking for an illustrator for the book of short stories for children I wrote. Would you be interested yourself, or do you know anyone who would? I love your work! Hi Jane! We should talk! email me at mckinneyjodi@gmail.com. Happy Easter! Thanks so much Kamal! Happy Easter! Your bunny has brightened my day and brought a smile to my face Jodi. I’ve missed your watercolour work… ! Thanks so much Evelyn!! Happy Easter! so, so cute and hoppy easter to you, too! You’re so talented. Happy Easter! You are so sweet! Thanks Mimi! Happy Easter! So talented! How are you keeping these beautiful paintings? Stored or displayed? Do you have a book or some type of organizer? These really are gorgeous – you could sell these you know or make adorable gifts cards etc… Thanks for sharing. Thanks!! I do sell them and make cards from them as a matter of fact! 🙂 My daughter in law and I have an ETSY shop and I sell at a local shop. If you’d like to see our ETSY – it is mckinneyx2designs. 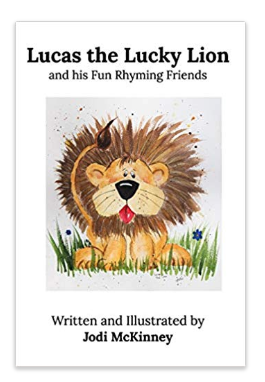 I also illustrated and wrote a children’s book that is for sale on Amazon. 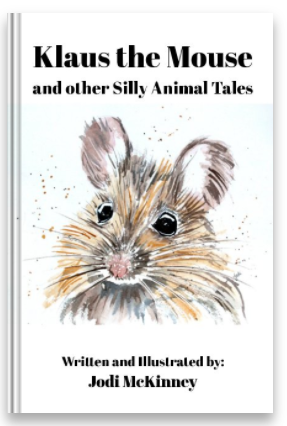 It is called Klaus the Mouse and Other Silly Animal Tales by Jodi McKinney. Happy Easter! I would love some cards – I’ll check the site out today. Thank you. And so cool on the book! You are very talented – keep posting your beautiful work. He’s adorable, Jodi! Happy Easter! Happy Easter to the McKinneys!!!! Thanks for your beautiful Easter bunny in water colour, Jodi. I did not know that the custom of the Easter bunny originated in the country, where I was born. Happy Easter! Hoppy Easter to you too Jodi! Aww – thanks Christine! How nice to hear from you! Very festive. Happy Easter to you! Happy Easter Gary! Hope you are well. This is the most splendiferous Easter Bunny ever! He positively radiates a magical aura. Benjamin will love this colorful character… orange is his favorite, you know! Hope your Easter was overflowing with family, friends and many magical moments. Thank-you! I sure do know orange is my Benjamin’s fave! I hope he loves this Easter bunny almost as much as the real one 🙂 Sending hugs to a couple of my faves!!! Very cute. I drew bunny almost like yours but havent had time to paint it yet. Never knew how the bunny & eggs bonnets etc got made up. Hope you have a lovely Easter with family. Have fun painting yours Dena! Yes, I smile! :O Thank you, Jodi and I wish you nice Easter, too. In North Germany you have to search for the eggs in 30 cm of new snow. Unbelievable!! we got the snow today – yesterday was more Spring like – oh crazy Mother Nature! Benjamin says : “Hoppy is the bestest bunny! Gem, I hope his fluffy tail is orange too!” I assured him that Hoppy’s tail most certainly is orange. He wants you to know that he found “lots of eggs yesterday that had little cars and candy inside. And I got a humongous basket with everything in it, PJMasks and Reese’s pieces in carrots! Did Charlie get a basket too?” Another question from Benjamin : “Is it snowing at your house on Mars like it is at Gem’s?” Also, “Tell My Jodi, Thank-you for Hoppy!” A kiss on Hoppy for you too! His tail is orange FOR SURE my Benjamin! Charlie got some bones and treats from the Easter bunny and his niece got little yellow rubber boots filled with candy and pajamas and treats! And we woke up to a lot of snow – about 6 inches sticking to the trees and bushes. It is beautiful, and beginning to melt. Have a wonderful day you two!! The BenjaGem project this morning was building another Mr. Snowy while it was snowing! This one is on my deck again, the one we built on March 22nd. was in the yard on a huge tree stump. This is our 5th. Mr. Snowy this winter. He even built a wall around today’s in the hope it would keep Mr. Snowy “safe”. Benjamin will be dismayed tomorrow to discover that the wall and Mr. Snowy are melting. But, he will be very happy that Hoppy has an orange tail for sure and that Charlie was visited by the magical Easter Bunny too! Thank-you x 2!! Oh boy. Benjamin is going to be bummed about snowy but he sure has learned this winter about more opportunities to do it again. Lol. And I’m sure you’re teaching him other wonderful things too!! So pretty and cute! Love the history Jodi! Hoppy Easter to you Jodi! Your magical bunny is adorable!! He certainly did bring a smile to my face! Happy Easter, Jodi! Thanks Ann!! Hope yours was lovely! It was lovely. Thanks Mary.